(CNN) -- Hackers repeatedly attacked the Web site of Australia's largest film festival Saturday, asking organizers to apologize to the Chinese people for planning to screen a documentary on an exiled Uyghur leader. 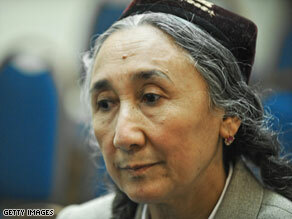 Uighur democracy leader Rebiya Kadeer waits to speak about the unrest in Xinjiang in Washington. The attacks were carried out on the opening day of the Melbourne International Film Festival -- in what organizers are calling the third phase of a "concerted campaign" to withdraw the film "The 10 Conditions of Love." The documentary examines the impact on the family of activist Rebiya Kadeer as she fights for greater autonomy of the ethnic minority group, the Uyghurs, in the Xinjiang Uyghur Autonomous Region in China's northwest. Kadeer is the president of the World Uyghur Congress, made up of exiled Uyghurs. China accuses the group of inciting riots in the region this month that killed more than 200 people and wounded more than 1,000. "The first stage was the local Chinese embassy asking us to withdraw the film," festival director Richard Moore said Sunday. "The second was to find a way for other Chinese films to withdraw from the festival -- five did so. We believe that this is probably not the end of it." "I couldn't repeat the language even if I tried," he said. "Lots of f-words and c-words, calling us racists, haters of Chinese people." The first attacks came soon after the festival opened Saturday. Several others followed throughout the day. In one, visitors to the site were greeted with a pop-up message that said: "We like film but we hate Rebiya Kadeer." The message was accompanied by a Chinese flag and ended with: "Please apologize to all the Chinese people." That attack was traced to an IT professional in Shanghai, China, Moore said. "He admitted hacking the site. He said he was acting as a private citizen and was protesting the film," he said. Authorities are investigating the source of the other attacks, but they appeared to be from different sources. "We're managing to plug leaks as fast as we can," Moore said. The first screening of the documentary takes place Sunday night. The filmmakers have invited Kadeer to attend another screening, scheduled for early August. "Every year, there's some level of controversy, from pro-life or anti-death (penalty) sort of position. We've never had an incident of an international scale before," Moore said. "The timing has absolutely been a critical one." The rioting in the Xinjiang region earlier this month stemmed from a brawl between Uyghur and Han workers at a toy factory in another part of China. Han make up the majority population in China -- and many Uyghurs resent the presence of Han in Xinjiang, many of whom came looking for work. Two Uyghurs reportedly died in the toy factory brawl. To protest the deaths, Uyghurs took to the streets in Xinjiang's capital Urumqi -- and fighting broke out between the two sides, with deadly results.